My father François Lambert (a.k.a. Frank Karosas) volunteered for Arbeitskommando number 3957 of Stalag VII A on 12 May 1944 with the intention of escaping, which he did do on 7 June 1944. He managed to evade capture for 5 days and covered 100 kilometers before being recaptured. I'm not sure how many escaped with him but maybe someone has heard of the escape that is a relative or was there. Monsieur Frank Karosas whose photograph is attached was an Allied Prisoner of War from 1940. He was captured in Prance, and escaped. He then fought with General De Gaulles Foreign Legion in North Africa, where he was again captured in 1943. 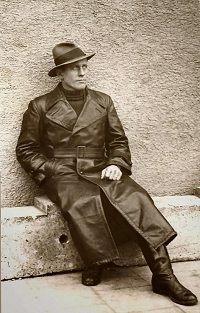 As he had already been captured before he changed his name to Francois Lambert and told the Germans that he was a Frenchman. He escaped again in Italy, was recaptured, and I first met him in May 1944 at Stalag 7A near Munich, as I had just changed places with a Guardsman myself. 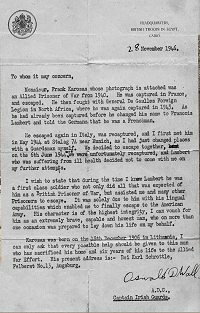 We decided to escape together on the 6th June 1944, but we were unfortunately recaptured, and Lambert who was suffering from ill health decided not to come with me on my further attempts. 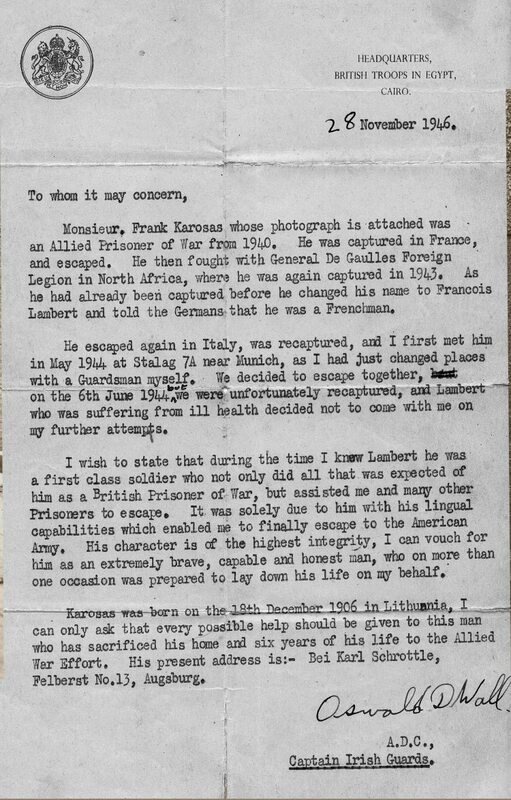 I wish to state that during the time I knew Lambert he was a first class soldier who not only did all that was expected of him as a British Prisoner of War, but assisted me and many other Prisoners to escape. It was solely due to him with his lingual capabilities which enabled me to finally escape to the American Army, His character is of the highest integrity, I can vouch for him as an extremely brave, capable and honest man, who on more than one occasion was prepared to lay down his life on my behalf. Dad kept quite a lot of documents after being freed from Stalag VII A. For 5 months, until the end of August 1945, he was working in the American Army at Heldenfingen under a Captain F.L. Harrison as part of Team 114, United Nations Relief and Rehabilitation Administration (UNRRA). 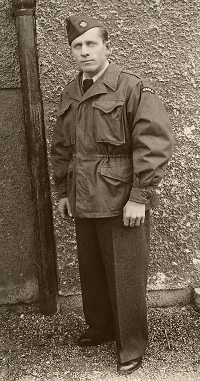 He then was moved to Augsburg and worked as an assistant stores officer for UNRRA Team 1062. He met my mother Aleksandra Zikova, who was from Naro-Fominsk near Moscow and they married on 31-10-1945. My sister Rose-Marie was born in 1946 and my brother George in 1947. They lived at the Polish D.P. Camp Infantry Caserne at Augsburg Area 5, starting on 1-2-1948. While working for the International Refugee Organization (IRO) they applied to emigrate to the U.S. and had been accepted but their papers were stolen and they were unable to go. As time went by, he became warehouse chief and was well regarded by workers and administrators. He and his family were accepted as immigrant refugees in May 1949 and they left Europe on 18-6-1949 on the ship Amarapoora at Taranto and arrived in Australia on 22-7-1949. The policy for immigrants at that time was for them to work for the government for 2 years before blending into the general population. He worked for the West Australian Railways, then tried his hand at various other jobs. In the meantime 2 more sons and one more daughter were born. Unfortunately, mum and dad separated and he went to work at the whaling station in Albany, West Australia, for the next 10 years. In 1959, being concerned that the Soviet regime might somehow trace them, he changed his name and all of ours to Lambert again. In 1968, he moved to Geraldton, West Australia, and lived there until 1982. He passed away on 4-6-1984 from cancer. Last update 8-6-2008 by © Team Moosburg Online - All rights reserved!